Copper jewelry offers a warmth that isn't associated with silver, golds or other types of metal. It's the rich red tone of the copper that makes it look elegant, but not too bright or gaudy. Perhaps this is why copper is often chosen as a metal for use in DIY jewelry making. Fortunately, copper wire is inexpensive and very easy to work with. A simple design, such as a braided ring, can offer experience to a novice jewelry maker. Learn how to bend, sculpt and cut wire so a copper ring looks exquisite on any finger. 1. Snip approximately 6 inches of copper wire from the roll. 2. Bend the wire in half. 3. Snip a second piece of wire that measures the same length as the wire in previous step (the length of the wire bent in half). 4. Place the wire from step 2, with the bend at the top, on a flat work surface. 5. Place the wire from step 3 in the middle of the bent wire. 6. Rip off a piece of masking tape from the roll. 7. Tape the top of the three wires to a flat work surface. The tape will prevent the wire from sliding around. 8. Braid the wire. 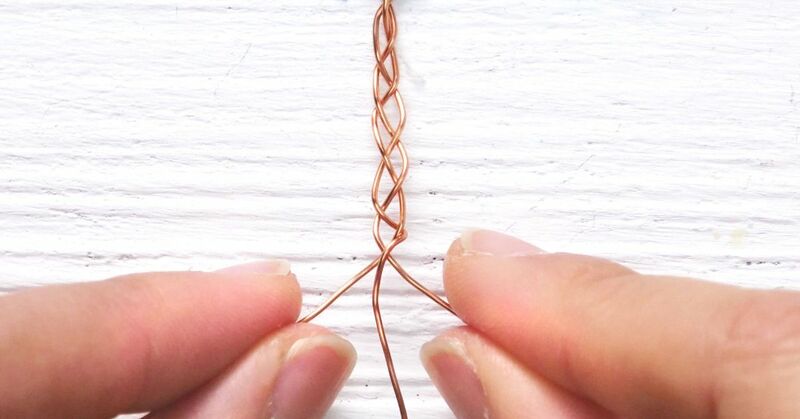 Do not braid the wire too tightly; the braided copper wire should offer the appearance of a Celtic design. 9. Continue braiding until reaching the bottom of the wire. 10. Remove the masking tape from the wire. Discard masking tape. 11. Bend the wire around a finger, using caution not to poke the skin with exposed ends. The wire should now fit the form of the finger. 12. Remove the wire from the finger. 13. Use wire cutters to trim sharp metal ends. 14. Use pliers to bend metal ends into the design. 15. Use pliers to fasten each end of the metal together, forming a ring. 16. Slip the ring over the finger and wear it.